I’m a huge Vim fan and using it since 2002 (the year I’ve started to learn Linux and how to compile Gentoo kernel). It’s a fundamental part of my life. But lately, I’m very sad about the performance on macOS terminals (iTerm2 and Terminal.app). On Linux, vim is literally flying, but on macOS, Vim rendering is very slow and lagging. This wasn’t always the case though. Some of the older version of iTerm2’s rendering was fast. I know it was fast. But with each macOS update and iTerm2 update, it would either get fast or slow. Some versions work decent, some don’t. And I didn’t want to stuck with an older version as well, as the newer version of iTerm2 always has a lot of bug fixes. After upgrading to a new machine (iMac Pro), I thought it would be much faster now that I have a beast under me. But nope :) Things don’t work like that. This was really frustrating. Upon some research, I’ve found my answer. I’m not alone. There are also other people who are not happy with current state of emulators. Joe Wilm decided to change it and started the project “Alacritty”. Alacritty, is a cross-platform, GPU accelerated terminal emulator written in Rust. It is focused on simplicity and performance and therefore it’s very opinionated, but at the same time also very ambitious. Time will tell how Alacritty will end up, but I see already that it has a lot of fans. What makes Alacritty so different from others? Simplicity is one of the core values of Alacritty. This means there is no GUI to change the configuration, no pane/window handling (no tabs or vertical/horizontal splits), no scrollback, etc.. The list goes on. Instead, one has to use something like Tmux to include all these features. This surprisingly works really good. However, there is an open PR that implements scrollback, so things can change regarding the focus towards simplicity. Appearance is another important part of Alacritty. One difference I could see is that with my new iMac Pro, the display supports the P3 color gamut. iTerm2 uses sRGB, whereas Alacritty uses the system color profile. The colors are much more vibrant in Alacritty. Alacritty is cross-platform. It aims a support for Linux, macOS, and Windows. Precompiled binaries will eventually be made available on supported platforms. This is minimally blocked in a stable config format. For now, Alacritty must be built from source. But, don’t start Alacritty yet. There are couples of configuration steps worth talking. Let’s do them. Now when you start Alacritty, it should start with this base configuration. We’re not finished yet as I’ve customized it a little bit for my need. What are these? # remove the line below! We’re still not finished though. The key_bindings field is interesting that it allows us to capture any shortcut and execute certain commands. We can even write escape sequences for certain shortcuts. 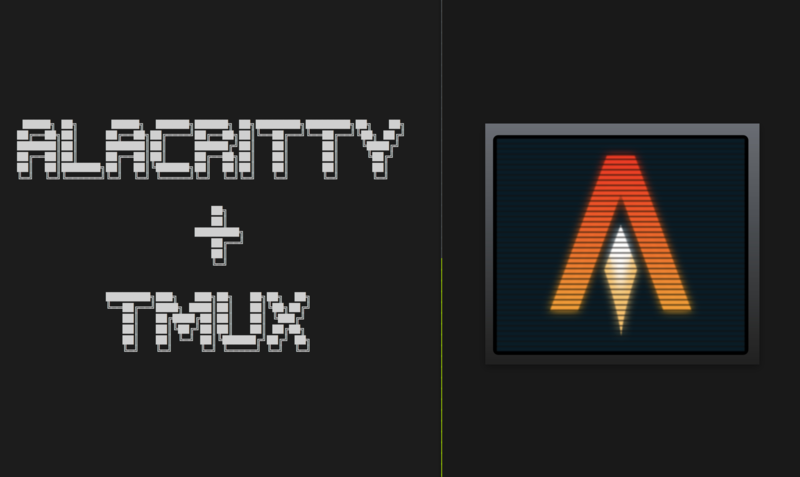 This is very powerful because it allows us to customize Alacritty even further if used with tmux. I like iTerm2 and using heavily the split/vertical panes, tabs, resizing the panes etc.. features of it. It’s heavily customized for my needs. As I said, Alacritty doesn’t support any of the bells and whistles. But it can be configured to send escape sequences (in hex code) for your custom shortcuts. Now the question boils down how to use these shortcuts in tmux? As I said, Alacritty can be configured to send escape sequences (in hexcode) for your custom shortcuts. So, for example, you can send a hex code that represents the key combination ctrl-f v which in my case opens a vertical pane. The hex code for this combination is: 0x06 0x76. There are many ways to find out how to obtain these hex codes. One of them is the tool xxd. xxd is a tool that creates a hex dump of a given file or standard input. This is very useful because escape sequences we set in Alacritty needs to be presented in hex codes. That’s it! Now whenever you press cmd + d inside Alacritty, this will automatically be transformed into the escape sequence \x06\x76 which then opens a vertical tab in tmux. Copy/paste is still a hassle for me. Selecting with mouse is possible, but I have to press y before I release my selection with mouse. This is really awkward. Because of that, I’m using more and more the vim-copy mode in tmux. This allows me to copy the text without using the mouse. It’s not the best for me right now, but let’s see if this is something I can live with. There is another weird bug that only happens when I focus on Alacritty by clicking with the mouse. In this case, the statusline of Vim suddenly jumps to the middle of the screen. When this happens there is no way I can fix it from the keyboard. I’ll update the blog post when I find a solution for this. Alacritty looks beautiful on my iMac Pro’s display because it uses the System (P3) color profile. iTerm2 doesn’t do this, therefore the colors look dull and are not vibrant as Alacritty. There is an open issue and the author of iTerm2 aims to fix it. I’m going to use Alacritty for a foreseeable future, however, I’m not closing the doors to iTerm2 either. With time I’ll see if I can live with Alacritty or not. Finally, I want to thank Cihangir Savaş and for his much valuable feedback and suggestions.